One of the biggest announcements of CES 2014 was not a single device, but a chip - the Nvidia Tegra K1. A huge step up in mobile graphics, the Tegra K1 is the first chip with a desktop-class Kepler GPU with 192 CUDA cores, up from 72. The SoC will come in two versions, one version with a quad-core (4+1) Cortex-A15 is set on arriving in the first half of 2014, and one that leverages two of NVIDIA’s own 64-bit ARMv8 Denver CPUs, which should start shipping in the second half of 2014. If you remember about the past with Tegra 2 NVIDIA’s big selling point was being first to dual-core in Android. Tegra 3 attempted to do the same with being first to quad-core. Tegra 4 just made things faster. Tegra K1 on the other hand does away with the gimmicks and instead focuses on fundamentals. Both K1 SoC ship with a full implementation of NVIDIA’s Kepler GPU architecture. 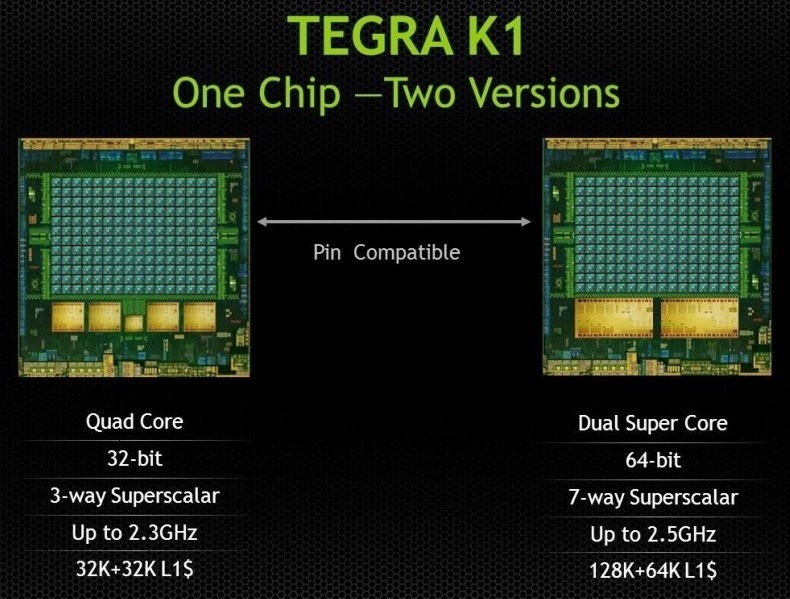 In fact, Tegra K1 marks a substantial change in the way NVIDIA approaches mobile GPU design. From this point forward, all mobile GPUs will leverage the same architectures as NVIDIA’s desktop parts. As if that wasn’t enough, starting now, all future NVIDIA GeForce designs will begin first and foremost as mobile designs. NVIDIA just went from playing with mobile to dead serious in a heartbeat. To demonstrate the prowess of the new K1, Nvidia has set up a number of customized Tegra Note 7 prototypes around the periphery of its press event. They include demos of the custom build of Trine 2, the highly impressive Digital Ira real-time face-rendering demo, and even a version of Serious Sam 3 — all running on the new K1. Importantly, there was no mention on what sort of devices the Tegra K1 would be able to fit inside. We're seeing it working on 7-inch tablets that are relatively thin and compact, but would the same 2GHz+ power be available inside your next Android smartphone? That's yet to be revealed by the company, as is the actual release time for Tegra K1 devices of any size class.